Yellowing of leaves could certainly be due to the environmental change. 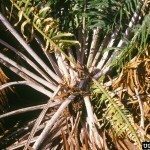 Watering issues can also be indicated by yellowing of the fronds. Watering may need to be adjusted with the move also. Check the soil instead of watering on a schedule. These articles will help refresh you on the care requirements.